Strictly Warning !!!!! In this booklet given method and mantras are very Rare and Strong , please practice things under proper guidance . Also Given things are only for guidance. The word Sadhana generally indicates ‘a means to an end’. In the realm of Indian religious philosophy the word connotes the practice of an essential discipline through which spiritual realization is attained. 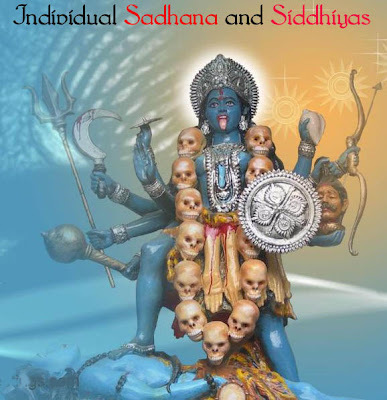 Sadhana varies to suit different religious practices though the ultimate aim invariably is salvation. Sadhana, in its diversity involves worship, prayer, meditation, and the purification of body, mind and soul. Hindu sadhana is the science of spiritual discipline. As long as discipline of the mind and body is essential for self-realization, the value of sadhana cannot be belittled. Siddhi is the attainment of perfection reached through unrelenting sadhana. * Normal Siddhis: all those forces of the conditioned world that transform elements. * Extraordinary Siddhis: the ability to open beings up for the liberating and enlightening truths; to lead to Realization. "Vashishtji said to Lord Rama: He Ramji! Jo Manush Janam paakar bhi aatm padd paane kaa yatn nahi karte ve bade dukh ko prapt hote hai"
Please upload this book at DepositFiles as I created paid account to download these books, but later I come to know that all files are not there at DepositFiles. Please do the needful.